Interviewer claims Snowden leaked 'deal' for NSA to share spying information on Palestinian Arabs with Israel, via Unit 8200. Former US intelligence analyst Edward Snowden has accused the US National Security Agency of routinely passing private, unedited communications of Americans to Israel, an expert on the intelligence agency said Wednesday. James Bamford, writing in the New York Times, said Snowden told him the intercepts included communications of Arab- and Palestinian-Americans whose relatives live in Israel and the Palestinian Authority (PA) could become targets based on the information. 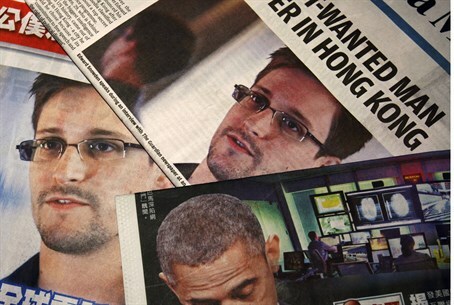 "It's one of the biggest abuses we've seen," Bamford quoted Snowden as saying. Snowden said the material was routinely transferred to Unit 8200, a secretive Israeli intelligence organization. Bamford cited a memorandum of understanding between the NSA and its Israeli counterpart outlining transfers that have occurred since 2009. Leaked by Snowden and first reported by the British newspaper the Guardian, it said the material included "unevaluated and unminimized transcripts, gists, facsimiles, telex, voice and Digital Network Intelligence metadata and content." The memorandum indicates the data is routinely sent in raw form, without editing out names or other personally identifiable information, Bamford said. He noted allegations in Israel by leftist veterans of Unit 8200, who in a letter to Prime Minister Binyamin Netanyahu last week accused the agency of using information it collects to "politically persecute innocent Palestinians." The data gathered by the unit included Palestinian Arabs' sexual orientations, infidelities, money problems, family medical conditions and other private matters that could be used to coerce them into becoming collaborators, they claimed. Veterans have since fervently denied those claims, and many politicians from both ends of the political spectrum have called for the signatories to be dismissed. Snowden, a former NSA contractor, is wanted by the United States on espionage charges after leaking a mass of secret NSA documents. The 31-year-old fugitive is in asylum in Russia, where he has been granted a three-year residency that allows him to travel abroad. Bamford, author several books on the super-secret NSA, which specializes in electronic espionage and code-breaking, interviewed Snowden over a three-week period in Moscow for Wired magazine.